And that’s something we believe in strongly at 4 Axis! We’ve been in the running for 6 straight years and have learned much on our journey, but to think that we’ve got it all figured out, we know, would be a mistake. There’s still so much that we as a company have got to figure out and we’re always eager to learn from the very few successful people and organisations in our industry, who we look up to. Dr. Sanjiva Weerawarana is one such individual, who recently, much to our delight, agreed to visit our humble office to give us a glimpse of what it takes to achieve the best. Being the founder and current chairman of WS02, one of the world’s leading open source technology provider, Dr Sanjiva is one of the most respected and sought after individuals in the software industry, and as we were hoping, he definitely had a lot to offer..
We learned that like us, he is no stranger to starting from scratch, and it was quite inspiring to hear of his subsequent journey to success! But at the same time, our guest, being ever so humble, never shied away from admitting that things never came easy for him..
From having to face the challenges of developing products for global customers the likes of eBay, Verifone and Motorola, to managing a rapidly growing company, Dr. Sanjiva had to face testing times that have helped him shape up to be the person he is today. 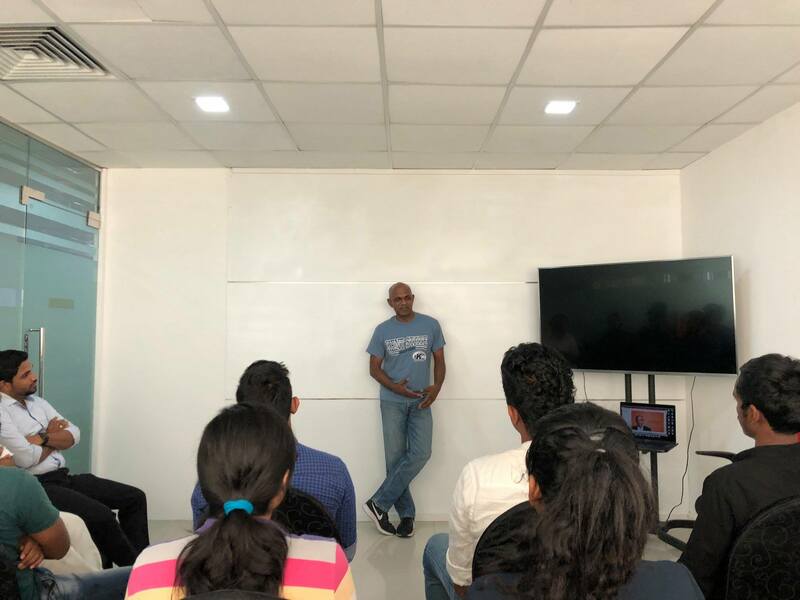 In the true spirit of mentorship, he reflected on past experiences to share with us the many lessons he learned, particularly the ways in which he managed the not-so-easy task of leading a company of more than 500 diverse individuals! We learned that amicable relationships between employers and employees go a long way in keeping everyone committed to the same goals, something that we ourselves have begun to work towards at 4 Axis.. It was certainly a fascinating encounter, learning from someone who holds experience in more areas than one, and as our session with Dr. Sanjiva came to a close we were left with a good sense of what to expect further on in our journey! It’s always interactions like these, meeting those we look up to, hearing their stories and struggles, that really get us inspired to strive for the best in everything we do. We’ve always been in awe of not just the invaluable skill Dr. Sanjiva brings to our industry but also by his honest, open and constantly friendly personality that has no doubt contributed to his excellent repute. We will always remain extremely grateful to Dr. Sanjiva for agreeing to spend a precious few hours with us and we wish him nothing but the best for all that he has planned ahead!